Or, get it for 7200 Kobo Super Points! Amanda Dienner hasn't seen her Old Order family in five years when she receives word that her mother has passed away and left her Lancaster County's most popular Amish bed-and-breakfast. Now an Englisher, Mandy is shocked: Her twin sister should have been the obvious choice! What's more, the inheritance comes with a catch: The farmhouse inn will only truly be hers if she is able to successfully run it for twelve consecutive months. Mandy accepts the challenge even though it means returning to Gordonville and the painful memories she left behind at eighteen. Still, she's determined to prove she is more than capable of running the bed-and-breakfast, no matter that its loyal clientele are expecting an Amish hostess! The inn isn't Mandy's sole test, however. Rubbing shoulders with her married twin sister reopens wounds that Mandy isn't ready to forgive. And an Englisher guest with a difficult past of her own just complicates matters. Can Mandy fulfill the terms of her inheritance? Or will this year in Amish country prove a dreadful mistake? Was this helpful to you? Great book as always from Beverly Lewis. I have read everyone of her books and never been disappointed. I am waiting anxiously for the new one to be released next spring. Maybe someday she will have a tour near me and I can personally meet her. Latest novel by Beverly Lewis! The Proving by Beverly Lewis takes Amanda Dienner back home to Gordonville, Pennsylvania. Amanda “Mandy” Dienner left home five years ago after discovering her twin sisters, Arie Mae, betrayal. Mandy has been living and working in Scott City, Kansas. One day she receives a certified letter from her older brother, Jerome telling her that her mother, Saloma passed away unexpectedly. Mandy learns that she has been left Butterfly Meadows, the families Amish bed-and-breakfast, to her. Mandy would have expected the B and B to be left to Arie Mae. The inheritance comes with the condition that Mandy run Butterfly Meadows at a profit for twelve consecutive months. Mandy returns home to take over the inn, but she is not prepared for the community’s and guests feelings about her non-Amish status. Will Mandy be able to handle the close proximity to her sister and her husband? Can Mandy find it in her heart to forgive and move on with her life? 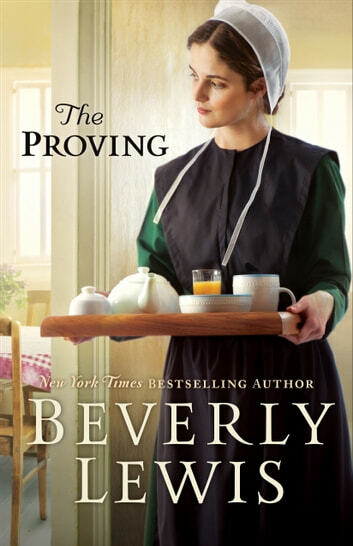 The Proving is well-written, engaging, and has a nice easy flow. I liked the main characters and their stories. It was nice to follow their journey and see how they changed/developed. I only summarized Mandy’s portion of the story and her challenges (lack of cooking skills, not being Amish—when guests expect an Amish hostess, resentment). There is Catrina Sutton who signs up for a mystery vacation (hoping for beach destination) and ends up at Butterfly Meadows. Some of themes in The Proving are forgiveness, power of prayer, love, and letting God take the driver’s seat on your life’s journey (He is in control, not you). It is amazing what happens when you pray and believe. My rating for The Proving is 4 out of 5 stars (I liked it). The story is somewhat predictable (romantic outcomes especially), but I enjoyed reading this pleasant Amish book. The Proving is a lovely, heartwarming novel that provides a delightful respite from reality (which we all desperately need at times).